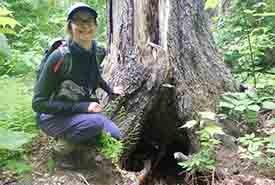 If you ask Allison Patrick, conservation biologist for the Nature Conservancy of Canada’s (NCC’s) Atlantic Region, to describe the Caledonia Gorge property, she will point you towards the area’s magnificent Acadian forest. The property boasts 326 acres (132 hectares) of mature, Acadian forest, a rare forest-type, with less than five per cent of its kind left in the Maritimes. In addition to a unique forest, the property also boasts part of an exceptional geologic feature called the Arabian Vault. According to Allison, this feature is a canyon with steep sides through which flows the Arabian Vault Brook. It provides drinking water for the community in the nearby Village of Riverside-Albert. NCC is working with the community in order to protect this vulnerable forest, which is responsible for a large portion of the village’s fresh water reserves. Nearly 100 years ago, the village leased 22 acres (nine hectares) of the land around the brook for its water reservoirs from a previous landowner. The lease was set to expire in 2019, and then NCC entered the picture. Under a new arrangement with NCC, the village will own the land surrounding the reservoirs, while NCC will protect the headwaters of the Arabian Vault Brook where the forest will continue to act as a natural filter for the water. NCC staff continue to conduct field work on the property to gather a better understanding of what species live here and how to maintain the natural integrity of the landscape. According to Allison, communities of both people and wildlife rely on this unique habitat type. By working with the nearby community in the Village of Riverside-Albert, NCC is fostering a connection with people who are deeply ingrained in the ecological and historical features of the land.